Lens Description: The Schneider 35mm f/5.6 Apo-Digitar XL Lens with Schneider Electronic Shutter is an extremely wide angle large format lens specifically designed for use with digital backs, which require extremely resolved, color correct image circles of a smaller size. Digital backs also benefit from use at larger apertures to avoid image degradation from diffraction, and this Apo-Digitar XL can comfortably be used at its maximum aperture at all times.rnrnThis version of the 35mm Apo-Digitar-XL is mounted to a Schneider Electronic Shutter, which is a compact shutter with PC or hand unit control, speeds from 1/60th to 32 seconds, and aperture control in 1/10th f/stop increments. 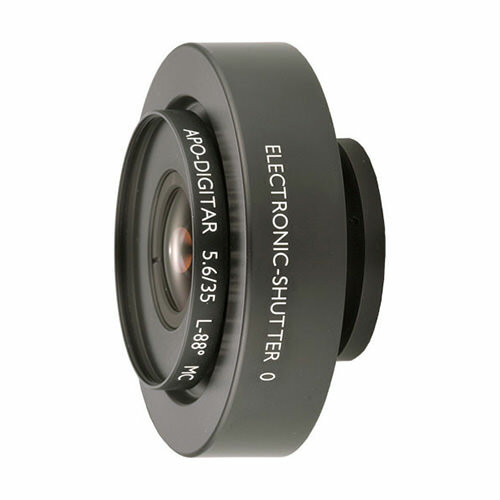 It is so small that it can easily be mounted into the body of many camera\'s lensboards, essentially shortening the minimum bellows extension of the camera system.